Compatibility testing is the major process which separates the transfusion of red blood cells from the administration of other types of pharmaceutical products (Chapter 1). The purpose of compatibility testing is the avoidance of a hemolytic reaction. This is of cardinal importance, since some types of hemolytic reactions can result in a fatal outcome. The technical procedures used in compatibility testing have undergone significant changes over the past few decades. The critical steps in this process are shown in Table 7.1. Although not often properly appreciated or given adequate emphasis, the first important step is correct identification of the intended recipient at the bedside at the time of venipuncture. This requires accurate labeling of the specimen tube by the phlebotomist before leaving the site at which the venipuncture was performed. This is interpreted, at a minimal, as the first name, last name and a patient specific identifier, such as a medical record number, social security number, date of birth, etc. Unique identifiers are preferred, but may not be practical. The phlebotomist should be identifiable, either by a complete signature or a first initial and a last name; initials only may be acceptable. In addition, the time and date of sample collection should be written on the tube. All of this data is important and the only information which could be subsequently added, if omitted, would be the time or date of draw, since this information does not impact on identification. The specimens may be collected into prelabeled containers (tubes). If this is the practice, it is particularly essential for the phlebotomist to sign the tube immediately after sample collection. It is preferable, but not required, to collect the blood sample into an unlabeled container. The sample must then be immediately labeled at the bedside by affixing a preprinted label or handwriting the information. Labeling, and the identification of the phlebotomist, must be completed at the site of collection (bedside). It is unacceptable to complete any part of this process at a different location from the actual site of collection. Errors at the point of sample collection set the stage for the fatal outcome of a subsequent transfusion. The accuracy of this information is important for an additional reason. All Blood banks check for previous records on a patient and accuracy of the information allows early identification of a potential problem or delay in blood availability. 1. Correctly identify the intended recipient at the time of venipuncture. Label the tube at the site and time of collection. Sign the tube verifying confirmation of identification. 2. ABO typing of specimen. 3. D typing (Rhesus) of specimen. 4. Screening the serum for unexpected antibodies (called screening or; indirect coombs or; indirect antiglobulin test). type of the intended recipient. (b) If #4 is positive (abnormal), linking unexpected antibodies in the recipient with antigen negative donor units. 6. Correctly identify the recipient at the time of blood administration. indicated in Chapter 6, front typing and reverse typing will give complementary data. Although the need for both front type and reverse typing could be questioned, consistency in the front and reverse type give a sense of security with regard to the correct identification of ABO type. Rarely inconsistencies, as stated in Chapter 6, can occur but these can usually be resolved by the blood bank. In urgent situations, transfusion of Group O red cells and AB plasma is preferred until the discrepancy is resolved. The next important step is typing for a single antigen, called D, in the Rhesus system. Individuals who type as D positive are called Rhesus positive and those who type as D negative, are called Rhesus negative. This is a front type (antigen type). No "back typing" is performed for the Rhesus system, since unlike the ABO system reciprocal antibodies are not routinely detected in the serum. Antibodies to D or other Rhesus antigens are detected in the antibody screen (see below). 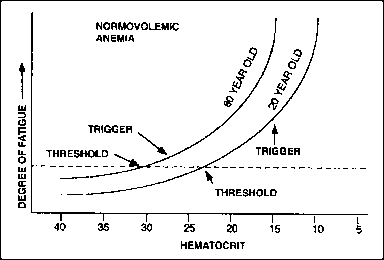 (often anti-D in Rhesus (D) negative patients), but also against antigens of the so-called minor blood group systems. For a more detailed description on these antibodies, the reader is referred to reference textbooks on blood transfusion. If the antibody screen is negative (the common situation), then the next step is to link the ABO type of the donor unit with the ABO type of the intended recipient. A simple cross-match (called immediate spin) can be performed at this point which ensures ABO compatibility or computer records of the ABO types can be used to match the donor and recipient (electronic cross-match). If the antibody screen is positive, identification of the antibody must be performed, and transfusion of red blood cell units which lack the antigen is required. In these cases, a more extensive cross-match (antiglobulin cross-match) procedure is performed, which is similar in principle to the antibody screen. This accounts for the delay often encountered in the availability of blood for these patients. After these steps have been completed, the blood may be dispensed for transfusion. A most important part of compatibility is correct identification of the recipient at the time of blood administration. There may be different procedures by which this is achieved, depending on the site of transfusion. In the past, most blood was transfused in a hospital setting. Hospital patients tend to be more easily identifiable, since they commonly have an identification band attached which contains identifying information. This is not always the case, however for example, in emergency rooms, outpatients or in other settings, such as operating rooms when the identification bands may be removed (e.g., for A-line insertions) or inaccessible. Different protocols for proper recipient identification should be in place for each location to ensure that the recipient is properly identified. Although identification of a recipient by one individual is acceptable, this is most commonly performed where possible by two individuals, one of whom is generally either a nurse or physician. This may not be possible, however, in all locations. Errors at this point are fortunately uncommon but can result in very severe reactions, occasionally with fatal outcome. This is a particular problem in situations where blood is being transfused under stressful conditions, such as rapidly bleeding patients in the operating room or trauma patients in emergency rooms. This problem is further compounded in that such patients may be unconscious, and hence the early clinical features of hemolytic reaction may go undetected. Blood observed in a urinary catheter or severe hypotension may be the first indication of acute hemolysis. Each of these sites, therefore, may need to develop specific procedures to ensure that proper identification occurs. Figure 7.1 illustrates the relative importance of the technical tests in compatibility testing. Transfusion of blood from a Caucasian donor population to a Caucasian recipient without regard for ABO type of the recipient or donor blood would result in an ABO incompatibility in about 33% of cases. If the ABO system is matched appropriately, and no other tests are performed, then the likelihood of a successful transfusion reaction is high. 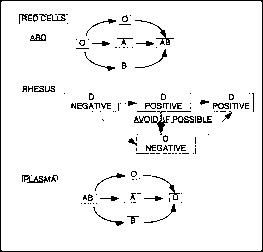 The common problem would be the transfusion of Rhesus positive blood to Rhesus negative individuals, which would result in the formation of anti-D in approximately 90% of Rhesus negative recipients. Fig. 7.1. Different outcomes from red cell transfusions when different technical steps in compatibility testing are performed. This would cause difficulties with subsequent transfusions or future pregnancies. If ABO typing and Rhesus typing are performed, then the likelihood of an uneventful transfusion episode is high. The difficulty in these cases would be the small number of transfusion recipients, (overall less than 3%) who would have an unexpected antibody, which reacts with an antigen in the donor blood. With antibody screening, nearly all of these antigen are eliminated, with the result that in less than 1% of all transfusions are normally associated with reactions. 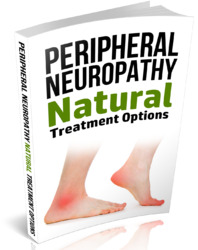 These are generally of a mild nature causing mostly short-term patient discomfort. These reactions are unrelated to hemolytic reactions and mostly due to contaminating white cells, and are discussed in more detail in Chapter 32. Fig. 7.2. Safe compatibility choices when ABO and Rhesus identical blood components are not available. any significant hemolytic reaction is statistically, extremely low. Thus, crossmatching as a laboratory technical procedure is being de-emphasized, and in the near future, clerical (electronic) crossmatching is likely to become standard for the majority of blood units transfused. Lastly, it is important to appreciate the distinction between ABO and/or Rhesus identical blood and ABO and Rhesus compatible blood. The transfusion of various blood products to transfusion recipients which are compatible is demonstrated in Figure 7.2. In general, it is common practice to transfuse ABO and Rhesus identical blood where possible. However, under certain circumstances, it is not uncommon to transfuse ABO compatible blood, such as group O red cells to non-group O recipients or group A red cells to blood group AB. In addition, Rhesus negative units may safely be transfused to Rhesus positive patients, but this is uncommon because of the limited availability. The transfusion of a Rhesus positive unit to a Rhesus negative recipient is best avoided. However, shortages of Rhesus negative blood do occur, and this occasionally has to be done to conserve community supplies. The recipients in these cases should be preferably males or females well beyond childbearing age (arbitrarily > 50 years) and have no evidence of an anti-D (negative antibody screen). The inadvertent transfusion of a Rhesus positive unit to a Rhesus negative female of childbearing age is a major error and constitutes the most important practical aspect of ensuring Rhesus compatibility for most recipients. How is a blood crossmatch performed? What is the proper first steps to completing a successful blood screen at hooperholmes? How to ensure proper id for blood transfusion? Why is blood compatibility testing important? What is the importance blood compatibility ina blood transfusion for the recipent? 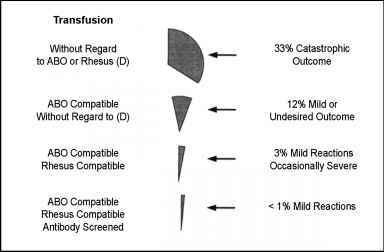 What is thebimportance of compatibility test in blood transfusion? Why compatibility test is important? What are importance of compatibility testing blood? WHAT IS THE RISK FOR BLOOD TANSFUSION WITHOUT COMPATIBILITY TESTING?